The stories in this anthology are impressive in ideas and style. When M.P Hicks sent me an ARC of this I didn’t expect to be getting a review up as soon as this, but these stories got me there because I couldn’t stop reading them. There were a couple that didn’t satisfy me as much as the others, but even then I found things to admire. What I really liked about Cyborg Chronicles was how it was rather like the reading equivalent of a music album where the order of tracks was carefully selected so the whole thing flowed and changed pace at the right times. Some of these stories are teasers for other work by the author, set in the same world, and others are standalones. The locations are varied, as are the purposes served by cyborg characters. There’s a good balance of 1st to 3rd person narratives and each author has their own unique stamp on the writing style. I’ve reviewed each story individually below, but I appreciate this review might get into TLDR territory, so here’s a bitesize summing up first. – You like robotics and enjoy the hard science behind it all. These authors all put a good deal of research into these stories and most offer up an afterword telling the reader where some of it came from, and it’s not just about the robotics. There’s some great hard science here all round. – You like short stories that are longer than average but still a fast read. A lot of them are action based, but even the more reflective ones are still quite pacey. – You’ve never really liked robots as main characters but are willing to have a go with humans who are only part synthetic and still have (varying degrees of) human emotion and motivation. (That reader is basically me – this was reading outside of my usual preferences and I hugely enjoyed it). – You are searching for self-published sci-fi authors who are at least as good as traditionally published ones (some of these authors have published traditionally as well as doing self-pub). – You like stories that debate ethics. Do I have a favourite story? Alright, I’ll pick one. There are four I’ve awarded the elusive five stars to in the individual reviews below, but if you have a couple of hours reading time to check out just one work in this anthology, read ‘His Name in Lights’ by Patty Jansen. The other three stand-out stories are ‘Hide and Seek’ by Eric Tozzi, ‘Preservation’ my Michael Patrick Hicks and ‘Charm Bracelet’ by A.K Meek. Here are the stories reviewed individually and spoiler free. The perfect choice of story to open the anthology, this is a nice blend of crime fiction with speculative; it reads more like hard-boiled city noir but the science behind the cybernetics is all there as well. The emphasis is on the cat and mouse of catching a killer, and there’s some brilliant use of surveillance and evidence gathering techniques, but it never feels like an episode of CSI. There’s some nice depth to the main character Ruth. Only the ending of this story disappointed me slightly. If you’re reading this on Goodreads, I’ll put a bit of discussion under a spoiler tag. I enjoyed the voice of the 1st person narrator in this one. It’s probably the most light-hearted of all the narratives in this anthology, despite being overall a serious story about life and death, and with a revelation that hits quite hard. Maybe it was the style, but the cyborg fighting ring setups here put me in mind of the opening of Big Hero 6, but done with adults and putting them in the ring instead of robots. This could easily have gone into more comedy territory, but Paul Swardstrom skillfully guides it into darker places. The twist made the difference in this story. I’ll keep it spoiler free, but I was ready to award it 3 stars until I got to the end. It was all getting a little too familiar – cop befriending a kid in need of a father figure, cop battling a against the city and even other cops, it was all well written but I’d been there before. Then the game changed. Johnny Rangers, despite having a name that could be straight from a b-list police action movie, is a character I did root for, and there’s an amusing use of a ‘pleasure’ cyborg in this story (I did guess that this idea would come up in this anthology at least once, and was glad that Cabrera provided it). It’s hard to write a story where the most engaging character is an animal, but here’s a great example of one. We’re most certainly not in How to Train Your Dragon territory though – this animal is a killer of the highest order and an experiment in lethal cybernetics created by humans, and yet there is a similar amount of sympathy to what many audiences would have for Toothless the dragon – Leon the cybernetic lion can’t help but be what he is, everything people know about his species is either wrong or very misguided. The right kind of human interaction could manage him, but there is always someone out to abuse power. If there’s one story in Cyborg Chronicles where the surrounding world is brought to life more vividly than any other, then this is a contender, because it has the best tension and although it runs towards a somewhat inevitable outcome, I wanted to see it happen and didn’t mind that it didn’t surprise me. The real brilliance though came through how Leon communicates with the people around but both they and the reader never really know whether what he says is reliable, or even if it registers on any level of emotion we could comprehend. This is the Romeo And Juliette story of the anthology – forbidden love and forbidden places. I liked the idea of a cyborg class system in this story, created by numbers of the various series, who aren’t strictly speaking supposed to associate with each other or learn the truth about certain places. This is a story where the idea of recycling a living thing comes nicely into play. It relies less on violence than some of the other stories in the anthology do and provides something of a break from that kind of action, substituting it for a ‘what if we get caught’ tension and playing with the reader’s feelings for the more than likely doomed partnership between the two central characters. This is the story I didn’t get on with. I wanted to like it more, because the writing was strong. It has a denser, weightier pace than the other stories and was never boring thanks to some clearly thought out world-building, but it wasn’t exciting either – it was all potential that wasn’t brought to the boil. For me the stakes just weren’t that high; I didn’t care enough about either of the two main characters for the ‘does he/she survive’ tension to work for me. The idea of the cyborg placing a memory-trigger in a place she knew she would look got my attention, and then never went anywhere exciting once the trigger came into play. ‘Augment’ makes for an interesting comparison to ‘Upgrade Complete.’ Both stories deal with the idea of people fighting for the right to get to higher places and enhance their capabilities, but this story has one extra thing: the cyborg playing mentor to someone. It’s an effective trope for making the reader like this character before she gets to her ‘I’m going to change the world’ motivation. There’s some nice use of the backstory behind this, showing how the world used to be and why the system isn’t completely fair. I’ll allow myself a brief writer-moment here: it was nice to know I’m not the only one who likes having characters monologue hard in front of a council full of judges. The only place I felt this story fell short was that the said Council hid their thoughts and feelings for this troublemaker too much – there could have been some explosive debate here. The outcome was a little inevitable, but the author did admit in the afterword that this story was really an introduction to a much wider world. As a reader-hooking tactic this story works well. A few months ago I tried reading the first book in Patty Jansen’s Ambassador series and didn’t get into it. This story is easily enough to make me think I should give it a second go, and definitely also try the Shifting Reality / Shifting Infinity series that was developed out of this story. The research that went into this story is all too clear but never spoils the fiction in the way some hard-sf writers are prone to doing by getting too bogged down in the facts. Anything we need to know about Jupiter and its moons is concisely narrated and relevant, and makes me want to go dipping back into the numerous books I’ve looked at on the science behind the solar system. The tension is always high thanks to this, and not just because the ‘lives’ of the two cyborg characters on Io are at stake. There are villains in this story who I wanted to see get what was coming to them. Do they get it? I won’t spoil it, but lets just say there are plenty of curveballs and all the way through I thought it could easily end up with either a happy or a tragic ending. The idea of Jupiter’s clouds being used to spell messages when advanced technology could no longer reach people was simply brilliant, and added the author’s personal touch to a story that was already drenched in wow-effect. I read this on Christmas day, and was desperate to finish it before I had to do other things. Full marks awarded, this is the standout story of the anthology. Anyone who likes a strong female lead will love this as well – there’s a real sense of both Eilin Gunnarsson’s strength and her vulnerability as she tries to save two people without us knowing why until the end. Another story where the crime investigation makes it feel as much like a hardboiled crime thriller as it does sci-fi. Black market cyborg trafficking and dirty politics are all at play here, through a first person narrator protagonist who’s in for quite a nasty surprise. The tension brews beautifully in this story, right the way through the sting operation it centres around and then just when it seems like the actions over, there’s a brilliant last surprise. I did see part of it coming, but only just, and not all of it. In his afterword, the author says ‘…I love that feeling when I’m absolutely sure I’ve got a story figured out, and then the author does a literary nika move that leaves me flat-footed.’ I know just what mean, Dave. Congrats, mission accomplished! I loved how this story played with the idea of who the prey was in a safari style setting. It’s another poacher-ranger story, rather like Hide and Seek, with a nice helping of futuristic brain tech added to the mix. The Databiologic Receiver of Mnemonic Response, or DRMR, was the centrepiece behind two of Michael Patrick Hick’s other novels, and this time receives a completely different work-out in an entirely different context. Authors working the same concept their proud to have created into every story can become tiresome, but Hicks is a long way from burnout with his mind-power concept here. It’s used and abused to good measure by its somewhat renegade handler protagonist, who’s decided she’s had enough of fighting loosing battles and is taking it one stage further. Page turning carnage ensues, the kind I’ve loved in this author’s other works. If you can find anyone better at writing an ultraviolent action scene, let me know who they are. As a reader who’s pro-hunting but anti-poaching/illegal animal trade, and advocates respect and conservation of the natural world even if you take things from it, this story struck the perfect chord with me. Charm Bracelet is a brilliantly nuanced story. All the fine details in this are there for a purpose and what appears insignificant turns out to be vital. The setup in the backstory where a well-to-do and somewhat conservative family don’t approve of who their son chooses to marry is a familiar one, but it works: the narrator protagonist had my sympathy, and the constant switches between his past and present work perfectly for a story like this. Ambulance chasing is given a take I found wonderfully inventive, with some neat twists worked around it. This story is a tragedy that strangely doesn’t always feel like a tragedy. A.K Meek’s afterword is also quite entertaining. The shortest story of the anthology saved for last, and it’s another ranger-poacher one, but not the same as the other two like it at all. There’s an almost mythical quality to it thanks to the ‘chemical mist’ with ‘strange creatures’ living in it, and people vanishing just as easily. There’s the backstory of a lost mentor, the main story of a ranger on reprimand who’s going hunting for poachers despite her loathed boss’s orders, and the elusive ‘ghost lion,’ which provided some of my favourite descriptions in this anthology. This story has a satisfying ending that brings a more than satisfying anthology to a close. 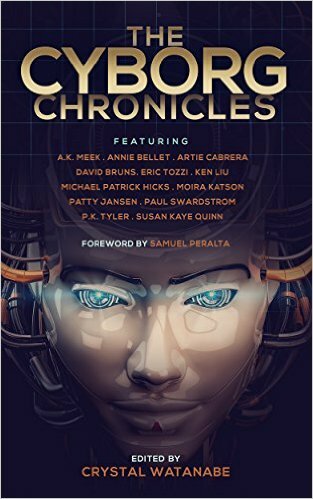 Many thanks to fellow author Tommy Muncie for his in-depth thoughts on The Cyborg Chronicles (releasing Monday, Dec. 28!). Lots of love went into these works and I am beyond thrilled to be a part of this anthology. Thanks so much for taking the time to write such an engaging, well-thought-out review! You’re welcome, it’s down to Mike Hicks sending me the ARC really, I hadn’t expected to read that this Christmas at all!